Here at Creative Coop we’re trying to come out of our shell. 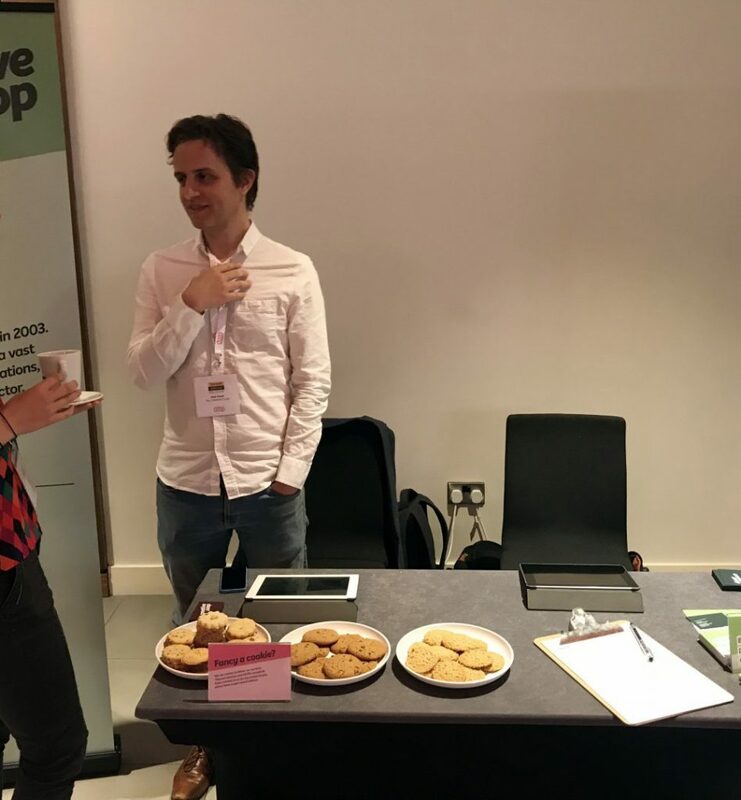 We’ve been working as a tech coop for a long time (officially incorporated in 2013, but working together under co-operative principles for much longer) without doing very much to raise our profile in the sector and support other coops. With this in mind we decided to exhibit at the Co-operative Congress 2018 in London (https://www.uk.coop/congress). We didn’t know what to expect, which explains why we brought far too many cookies (there was free food at the venue so we had to eat most of the cookies ourselves). It turned out to be quite a high-level event, with an interesting mix of speakers and topics. It’s hard for us to say how things might have changed from previous years, because this was our first of these events, but we thought that there was a common thread of “soul-searching” – what is the place of co-operatives in the UK economic environment, and how is the sector going to survive and thrive as the world changes with increasing speed? The first talk in the main room was “Practical policies to grow the co-op economy” and was a bit of a wake-up call. Andrew Pendleton from the New Economics Foundation presented some of their ideas, but emphasized that in the United Kingdom, cooperatives are operating in what he called a “hostile environment”. This hostility is present in government, regulation, law and the media, and means that there is not an even playing field for coops trying to compete with traditional companies. This is a little sad considering that England is regarded as the birthplace of cooperatives (if not in practice, at least in their legal form). It was a sobering start to the day. We also attended other talks on design, platform cooperatives, and commissioning tech work. But the main thing was meeting people at the stand and talking to representatives from other coops. We realized that we’ve been missing out by not making our presence known and missing out on mutually beneficial relationships with other coops. That’s what it’s supposed to be all about, isn’t it? We talked to people from Outlandish (https://outlandish.com/) and InFact (https://www.infactcoop.com/) and ended up being drafted into Cotech (https://coops.tech)! It feels good to be a part of a community that’s thriving in the UK despite the obstacles and we’re going to do more of it in future. Next time we’ll bring 1 box of cookies rather than 25.